The fifth Harry Potter novel, The Order of the Phoenix, is also the longest, clocking in at over 800 pages in paperback and taking the author three times longer to write than any previous book in the series. When it came time to adapt the novel the screenwriters had to take a chainsaw to the manuscript. Mercifully, this approach worked. Michael Goldenberg expertly focused the script on the core of the story from the novel whilst removing extraneous subplots. The loss of some of this material is a shame, particularly the removal of Ron's Quidditch storyline, but for the most part the cuts are well-judged and give us a fast-paced, action-packed film with some moments of more atmospheric reflection, courtesy of new director David Yates. The addition of Yates adds an interesting visual texture to the film. Best-known previously for the excellent BBC mini-series State of Play, Yates darkens the visual tone of the series and introduces a much greater sense of continuity and creeping menace. The Harry Potter world makes a bit more sense as a setting in the Yates movies, and his grasp of film-making is assured and compelling. Keeping Yates around to direct the next three movies as well was a very good move. New castmembers such as Imelda Staunton as Delores Umbridge and Helena Bonham Carter as Bellatrix Lestrange are also outstanding, Staunton's brittle-to-the-point-of-deranged Umbridge being a particularly effective antagonist. Where the film falters is when it includes elements from the book but can't pay them more than lip service: Nymphadora Tonks is well-played by Natalia Tena (later to appear in Game of Thrones) but she has such little to do in this or subsequent films that you wonder if the character should have just been cut altogether. The death of one major character, which was an important moment in the novels, is also kind of glossed over here. Still, the film succeeds in being a well-paced, well-directed and compelling piece of fantasy cinema. 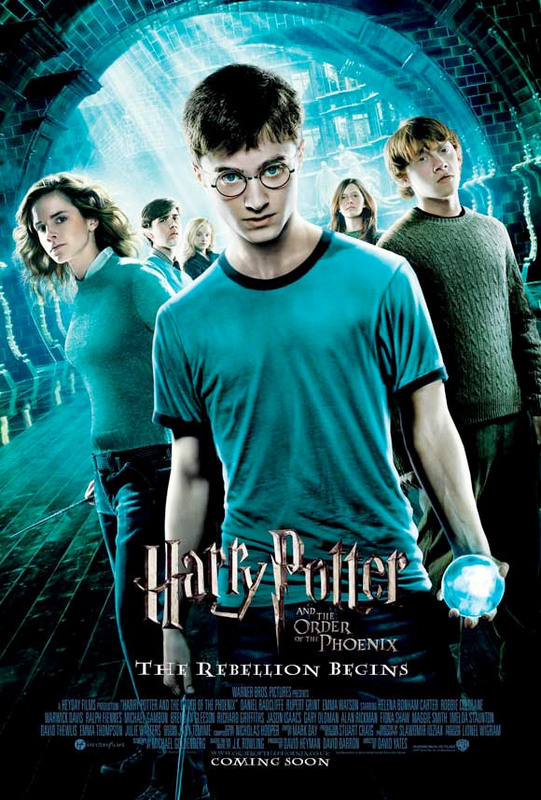 Harry Potter and the Order of the Phoenix (****½) is another fine addition to the film series. The movie is available now in the UK (DVD, Blu-Ray) and USA (DVD, Blu-Ray) as part of the Complete Harry Potter Movie Collection.